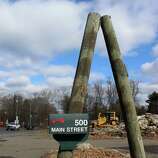 500 Main St.: Why has “the most dangerous intersection in Westport” never been fixed? The Planning and Zoning Commission will decide on whether to approve construction of a 12-unit "small home development" at 500 Main Street at a meeting on Feb. 8. WESTPORT — It’s been called “the most dangerous intersection in Westport” and the “intersection of death,” but, despite improvement efforts going back at least 15 years, the intersection has never been fixed. Over the past three years, there have been 22 accidents in or around the five-way intersection of Easton Road, Weston Road, Wassell Lane, Main Street, and the Merritt Parkway. Nonetheless, most residents have become inured to the confusion of passing through the intersection over the years. 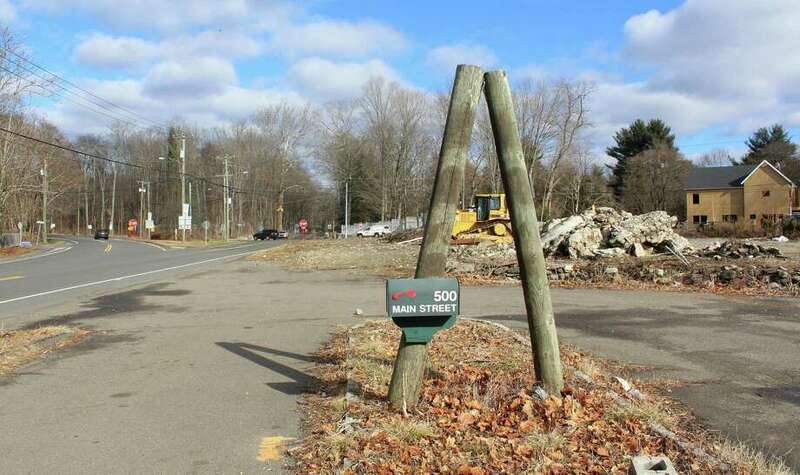 Calls to fix the intersection resurrected recently, however, in reaction to the proposal for a 12-unit senior housing development at 500 Main St., directly adjacent to the intersection. At the Dec. 14 meeting of the Planning and Zoning Commission (P&Z), resident after resident called on the commission to reject the proposal, brought by land-use consultant Mel Barr of Bar Associates, LLC, saying the P&Z should not approve the project until the intersection is fixed. “I think Westport and the state of Connecticut DOT (department of transportation) need to work together to mitigate the vehicular traffic in this area prior to any development being built on this site,” Daybreak Lane resident Bonnie Dubson said at the meeting, saying the intersection is unsafe for pedestrians, especially seniors, and the development will add more traffic to the already congested intersection. 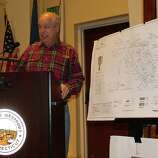 P&Z commissioner Greg Rutstein told residents the fate of the intersection is his greatest concern with the proposal as well. “Michael (Cammeyer, fellow P&Z commissioner) and I went to the traffic engineers office and we walked in with the main question of, ‘Will what we decide here have an impact on the future possibility of fixing the intersection?’. The simple answer we got, essentially, was not really,” Rutstein said. Although a small piece of the 500 Main Street property may be taken to fix the intersection, Rutstein said, besides that, the state owns all the land it needs to build a series of roundabouts, which local and state engineers agree is the best solution for the intersection. Easton Road, Weston Road, and the Merritt Parkway are all state roads and thus, efforts to improve the intersection have all been on the part of the state, and not the town, newly appointed Director of the Public Works Department Peter Ratkiewich said. “We prod the state for information and action, but for the most part, the past efforts have been on the part of the state, and they have been going on for quite some time, but most recently about 15 years ago they did a major effort to try and come up with some solutions,” Ratkiewich, a 28 year veteran of the Westport public works department said. William Britnell, Transportation Principal Engineer for the CT DOT, was a project manager for the DOT 15 years ago when the agency conducted an in-house investigation into fixing the intersection. “I can’t even tell you how many alternatives we looked at in terms of trying to get that intersection to work,” Britnell said, but added the engineers didn’t have much luck with any of the plans. One idea was to create a conventional four-way intersection with traffic lights, but Wassell Lane awkwardly bypasses the connector between Main Street and Weston Road making the solution difficult, Britnell said, in addition to the 5-legged intersection being out of character with the neighborhood and a notoriously bad solution among engineers. Although the three roundabouts (one roundabout would just back-up traffic at the next cross-section) solution on Weston Road, came close to working, it came with a catch, Britnell said. To fix the worst intersection in Westport, in other words, required the DOT first address congestion on the Merritt, a daunting task the state did not want to address at that time. “The state’s top priority is to keep traffic moving on Route 15 so when you look at the intersection you have to start there. What you do on local roads can’t have adverse effects on the Merritt,” Ratkiewich said of why the DOT abandoned the plans. For his part, Britnell said the roundabout idea was left behind because the town didn’t want to pursue a plan that included three roundabouts, which he said town officials didn’t think the public would support as roundabouts were new and unpopular at the time. And like Ratkiewich, Britnell acknowledged traffic concerns on the Merritt conflicted with efforts to fix the intersection. “The problem is we don’t want to fix it and create a worse problem somewhere else. There’s some validity to that in this case,” Britnell said. Memories of efforts to fix the intersection 15 years ago are fresh in the memories of Ratkiewich and Britnell because just this month, during the second to last week of January, the pair met with First Selectman Jim Marpe to renew conversations around fixing the intersection. “The volume of traffic has grown dramatically and, as a result, the concern among our local residents has grown with that. What at one time may have been tolerated or perhaps not as difficult in terms of volume is now seen as truly a problem and one that should be addressed,” Marpe said. Britnell told the Westport representatives they should start with a study analyzing the intersection as well as its relationship to the Merritt in order to come up with a comprehensive solution and suggested Marpe and Ratkiewich reach out to the state regional planning group, WestCOG, for study funding. Roundabouts are still the best solution, Britnell said, and more common than ever now with 20 currently in design at the CT DOT. Plus, roundabouts are the safest option, as Britnell said, “we see something like 50 percent reduction in crashes, 80 percent reduction in injuries” with roundabouts. Although state funding is difficult to come by these days — “right now we’re thinking about canceling existing projects, let alone adding new ones,” said Britnell, Ratkiewich and Marpe are motivated to see the project through, although the fix will take at minimum three to five years to complete. “It’s going to take a long time and a lot of money, but we’ve got to get started sometime,” Ratkiewich said.